Why a Meal? Where’s the Teaching? NYNO’s theology emphasizes the body of Christ, family, hospitality. It is hard to miss the centrality of all those things in the gospels. Luke notes that Jesus came eating and drinking (Luke 7:34). Part of what drives us is our dissatisfaction with ‘all-age worship’ services which usually cater well to the needs of one group of people. Perhaps the toddlers win, or the teenagers, or primary-school aged children. Alternatively, the service is enjoyable for adults, and children of all ages are overlooked and their needs forgotten about. How do we as NYNO attempt to do something different? Is there another way of doing things where we can all meet together, and no-one is overlooked, and everyone joins their hearts in worship and is uplifted and has a sense of belonging to the body of Christ, joined with him and with one another? Is this pie in the sky? Each time we have met together on a Sunday, we have emphasized the centrality of the Lord’s supper. Our first innovation in that meeting place was to change the seating so we were all gathered around the table. This eliminated the sense of someone being at the ‘head’ of the meeting. It is a visual spatial sign that we are all equals as we gather before our Lord. We have emphasized in our teaching that communion is central to our faith, and we have made clear that we will persist in gathering around the table even when we are not able to partake. Another concern which might arise with Sunday worship in this form is teaching. How do we achieve good teaching for all ages in one gathering? How do we make sure that the youngest child to the oldest pillar of the faith, who has known Jesus for eighty years has some sustenance? We believe that the answer for us as NYNO is to make our meal-gatherings the main meeting. We gather around the table; we serve one another; we take communion; we recite liturgy; we worship with our songs; we are all literally singing from the same hymn-sheet. Turning people into strangers is one way to make people distant, less dangerous. There is no way to hide in the back pew if we all sit side by side, united in Christ and to one another, from the youngest to the oldest. In these practices there is lots of ‘teaching’. Each time we meet we are reciting, praying and sacramentally participating in the basis of our faith. It’s possible that some may look at our gatherings and question whether we have enough ‘proper solid bible teaching.’ Several things can be said to this. Firstly, we are not against teaching. If your gathering has willing able teachers, by all means let them teach. We are anxious however, that those who do not have such gifts from God should not be impeded from developing their own churches. We hope that our corporate acts of worship will be deeply significant and beautiful and rich. In a situation that is diversely aged and there is a need for age-specific education, for children and adults, it may be most appropriate to provide that somewhere other than in the main meal gathering. Our reasoning for this is that adult oriented sermon can be difficult for children and their parents. Equally, a child oriented presentation can be dissatisfactory for adults. With our approach, separate ‘Sunday school’ classes for particular age groups could meet before the main Sunday meeting, or at another time in the week, to study the word together. Perhaps they will focus on a book of the bible, or a topic, and use different media as appropriate such as storytelling, drama or Godly Play. All that to say, our meetings around the table are the most important part of our fellowship. They are what define us and make us different. Hopefully, they are the distinctive part of what make us truly inter-generational. Teaching need not be compromised. It will just look different than a forty-five minute sermon for the adults, or a children’s talk, or separate children’s church, or an all-age service which is all about primary-school aged kids and leaves nothing for the grown-ups. Here’s a little how-to when it comes to the practicalities of hosting a NYNO meeting centred around a meal. We want to keep our breakfast gatherings as special as possible but also as simple to prepare as possible. For us, it meant a couple of loaves of homemade bread with butter and jam, and tea and coffee. Of course, you can use your own recipes, but we’ve included some of the ones we’ve used below in case you find that helpful. If there is a suitable oven in or close to the meeting area, doing some baking on the day creates some wonderful smells. Practically speaking we have found it sensible to do as much preparation as possible before we arrive, and then perhaps have one thing prepared, ready to pop in the oven during the hour before the meeting. Of course, if you had people who wanted to get together early and bake on the day that could be fun! Just so long as it doesn’t become a chore and people’s service doesn’t begin to displace our participation in worship as the most important thing. We’ll discuss liturgy in another place. But here it’s enough to say that how we sit together matters. We always try to give the impression of everyone sat round one table. Practically we can’t actually do this but we attempt to arrange what tables we have in something of a circle, with everyone seated around the outside. Here’s a diagram to illustrate. 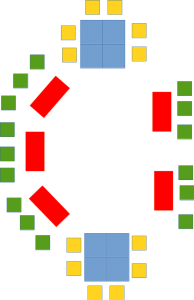 The blue squares are square dining tables, the yellow squares dining chairs. We arrange four of these tables into one large table at each end of the room and place dining chairs around three sides of the large table so that people are facing inwards to the room. 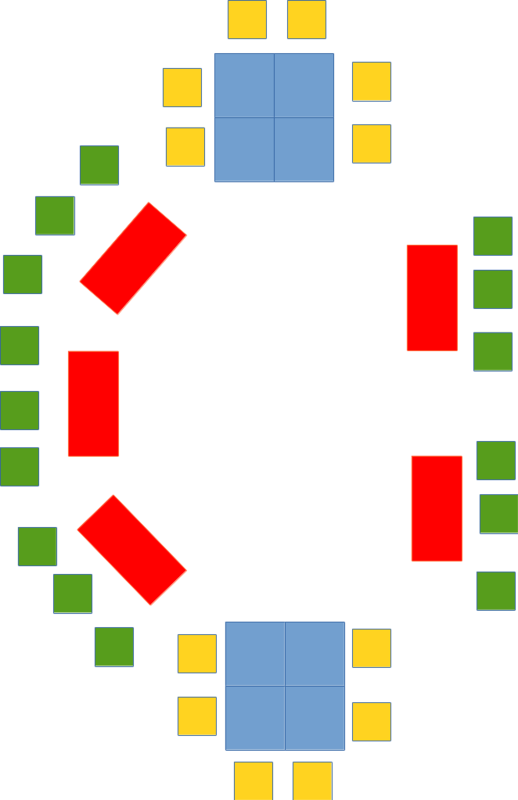 The red tables are are low coffee tables around which we place comfy arm chairs (green squares). It’s more important to us that people should be aware of being sat round a table together than that they should be able to hear a speaker. Our meeting is more about emphasizing the participation of the people than the performance of the preacher. Each table setting has a plate, cup and saucer, knife, and serviette, along with the liturgy. One packet of butter, cut into cubes and served in small dishes. About 2 pints of milk for teas and coffees, in four little milk jugs. A couple of sugar bowls, but we find that very few people take sugar in their beverages. A packet of fresh, ground coffee which last us 2 meetings. We make two large cafetieres of coffee and four pots of tea. We have clusters on the tables consisting of a plate of bread; milk jug, sugar bowl and teaspoons; butter and jam servings. They serve about 5-6 people. They should be in easy reach, and people are encouraged to serve one another. At the appropriate time, teapots and cafetieres are brought through from the kitchenette and again, we serve each other. The liturgy we’ve been using will be discussed elsewhere, in brief outline though the meal goes as follows. Before we eat, we say grace together. As we share breakfast, we enjoy fellowship with one another. At this point, we also offer around little forms and give people space to write down any items for prayer. Our meal is drawn to a focus point by taking all the items for prayer to God before one another in silent prayer. We say the Lord’s Prayer together and sing a final hymn. We bring our meeting to a close by speaking aloud the benediction to one another. Afterwards, we have found that people are very keen to stay and enjoy further fellowship. We are always inundated with people willing to help with the clear-up, dish-washing and drying, and taking leftovers home! Here’s a recipe for a simple soda bread. It’s fine to make the day before and bring to the meal pre-sliced. It’s a recipe by James Martin and can be found at bbc.co.uk/food . Tip the flours, salt and bicarbonate of soda into a large mixing bowl and stir. Turn onto a lightly floured surface and knead briefly. Form into a round and flatten the dough slightly before placing on a lightly floured baking sheet. Cut a cross on the top and bake for about 30 minutes or until the loaf sounds hollow when tapped. Cool on a wire rack. We find that 3-4 loaves is plenty for around 25-30 people to have a couple of thick slices each. Here’s a recipe for Hot Cross Buns, that worked so well on Easter Day, we may have to do it again before long. It was based on the recipe here. It worked well to largely prepare this the night before, leaving the buns on trays in the fridge over night, covered in clingfilm. I took them out of the fridge for a gentle second rising first thing in the morning. They’re ideal to bake just before a meeting because they only take 12 minutes and so have time to cool down before icing, ans also because they reate an impressive aroma. PROOF the YEAST In a small dish, heat milk in microwave about 1 minute to 105F – 115F. Gently stir in yeast and 1 teaspoon sugar. Set aside until foamy, about 5 minutes. SOAK the CURRANTS In a small bowl, whisk egg and yolk well. Stir in currants and zests. Set aside. MIX the DOUGH In large bowl, stir together 1/2 cup sugar, flour, spices and salt. With fingertips, blend butter into flour until a coarse meal forms (I’ve use the food processor for this stage). Make well in center, pour in yeast and currant mixtures. Blend thoroughly with hands, then form into ball and transfer to lightly floured counter. (Don’t worry, the dough will be sticky. If it starts off too sticky to knead on the counter, just knead it right in the bowl.) Knead 10 minutes, adding as little flour as possible, just enough to work dough without any stickiness when the kneading is done. FIRST RISE Transfer dough to a clean, lightly oiled bowl, first rubbing the dough mass against the bowl to lightly coat all sides with oil. Cover, let rise in warm place until doubled, about 1 hour. FORM BUNS & SECOND RISE With a fist, gently deflate dough. Cut into 30 pieces. I cut the dough into 6 and divide from there. Form buns and arrange on two or three baking non-stick baking trays. If you’re preparing the night before, cover gently with cling film and place in fridge. BAKE Preheat oven to 200º C (180º in a fan oven). Bake for about about 12 minutes. ICING. The icing can be prepared the night before and kept in the fridge. If it’s too stiff to pipe in the morning, place it in a microwave for 2 or 3 seconds – no more. For the icing, blend a tablespoon of melted butter with 2 tablespoons warm milk and a teaspoon of vanilla extract. Stir in about 250g of icing sugar. For Easter, pipe in crosses or on other occasions, more simply spread across the top of he buns.